A while ago I wrote a piece about how I kinda was a dealer for my husband's World Cup Stickers (thank the Lord that is over). It was bizarrely featured on CNN and impressed my male friends no end. Due to this little blog post we were invited to go and meet football pundit and ex Villa player Martin Keown. He was dishing out kits on behalf of McDonalds and the FA to a local grassroots team in the Castle Vale area of Birmingham. The husband? WAS RABID! I was also pretty excited to get the chance to meet another brummy mummy who was also handing out the kits, singer and TV star Jamelia. My girl obviously asked her a ridiculous question which you can see at the bottom of this post. It was such a lovely morning. My husband was so happy, and my boy loved watching the kids play football. Castle Vale is an area I know well as it is not to far from my Nan's house so it was nice to do something locally. As well as the lads from the Castle Vale team, McDonalds and the FA are handing out kits to local grassroots teams up and down the country. 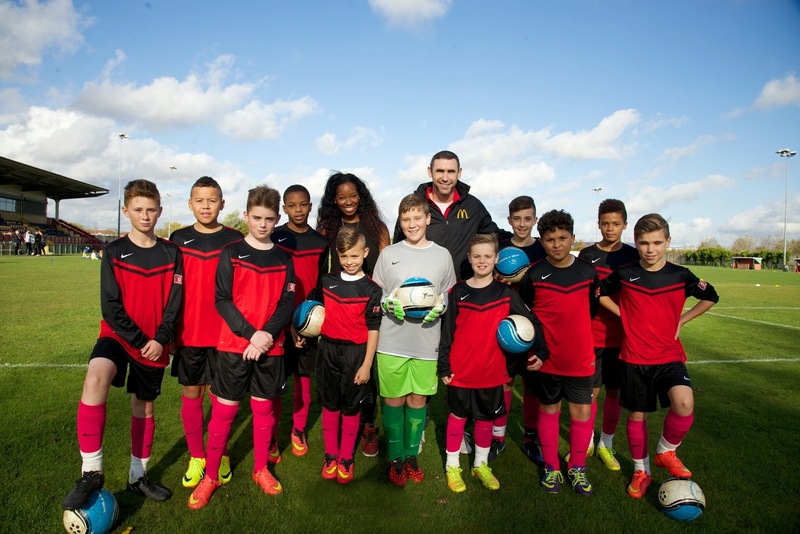 The new kit scheme with England official kit provider, Nike, will see over 50,000 kits across England distributed this year. Watch the girl ask Jamelia one of her trademark, hard hitting questions! Ahem. I love this! Jamelia is gorgeous! Does your hubby know that Match Attax are out?? ?